Almost a century after its discovery, vitamin D is still establishing itself as something of a wonder drug. The latest finding is that low levels of vitamin D may be to blame for a heightened risk of clogged arteries, which are directly linked to heart disease, in people with Type 2 diabetes. In a new study at Washington University in St. Louis, researchers found that blood vessels are less likely to become clogged in diabetics who get sufficient amounts of vitamin D. But in patients with insufficient amounts (the majority of the population), cholesterol tends to get trapped more in blood vessels near the heart. That results in blockages. When a diabetic has low levels of vitamin D, it’s like cholesterol molecules are encouraged to group together and build up in the arteries. That’s a big problem for the 26 million Americans who currently have Type 2 diabetes. That number has been steadily rising as obesity levels continue to grow. It has been shown that diabetics are at higher risk of heart problems due to greater inflammation. 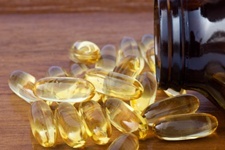 Past studies have shown that vitamin D plays a serious role in preventing heart disease. The new study furthers that opinion by showing that a certain immune cell is more likely to stick to the walls of blood vessels when vitamin D levels are low. Vitamin D helps immune cells called “macrophages” keep arteries clear. The new study included 43 people with Type 2 diabetes, and compared them to 25 similar people without diabetes. In the diabetic patients with low vitamin D, macrophages were more likely to stick to blood vessel walls. That means cholesterol also sticks, blood vessels stiffen, and blood flow gets compromised. The significance of this study is that it could lead to further studies indicating that vitamin D can help prevent atherosclerosis—clogged arteries. Even if that doesn’t happen in the near future, there are already a number of reasons—including promising evidence that it helps prevent cancer—to take vitamin D.
Riek, A.E., et al., “Vitamin D suppression of endoplasmic reticulum stress promotes an anti-atherogenic monocyte/macrophage phenotype in type 2 diabetic patients,” Journal of Biological Chemistry, November 2012; 287: 38,482–38,494.